This was one cool adventure. 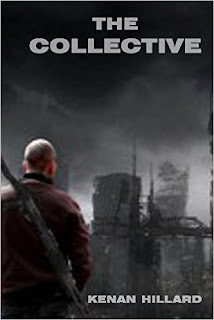 The last act of this novel really shines with brutal unrelenting action that leaves you reading as fast as you can just to keep up with the action. The beginning was really cool too. You delve into a dystopian world with the main character as he finds a way to make it without his family. In fact the only time I was a little bored was at the end of the second act where a bunch of info dumping took place about the powerful men who ran things in this cool post apocalyptic world. Those men are called The Collective and are who the novel is named after but the heart of the story is with a scrappy young guy named Abel. It was sort of interesting stuff and further developed the world building but it took me away from the main character's adventure and I really wanted to know what was going to happen next with him. It was a brief pit stop though and before long I was back in the story running and gunning with Abel. So overall it was an awesome ride through a desolate, quite interesting, and violent world. Abel has a terrible tragedy happen to someone very close to him and is then sent away from his home to try and survive in a world were water is everything. Water is sparse and so it has a lot of value. Gangs run the towns and everyone gives them whatever they want out of fear. Abel however does not fear them and against Abel gets himself in and out of a lot of very dangerous situations with is awesome fighting abilities. One of the things that shine in this novel are the fight scenes. I liked how Abel was an amazing fighter but it always felt like he could be killed at any moment. He was against odds that seemed like they would overtake him. I'm not saying he won every fight and I certainly don't want to spoil any of the story, but lets just say if you like action you're going to like this book. Another cool aspect of this novel was the world building. There are the towns who must follow every rule on exactly how much water they're allowed and if they don't follow this there are dire consequences. That's where we start out. Then we go to the towns out on the edge of the society where gangs plunder through violence and fear. Then there is a holdout against The Collective where one man named Warden has built a safe but dangerous refuge for those who follow him. He was probably my favorite character. Not only did he rule over a group of people constantly trying to prove themselves in gladiatorial battles for him, he was an amazing fighter himself and he proves it many times in the story. The end of the book to me was the best of it and you'll love rooting for the rebel fighters as they storm one of The Collective's bases and do all they can to try and take it over. Will they succeed? I guess you'll just have to read the book to find out? It's a real nice coming of age post apocalyptic adventure story. I'm glad I read it. Watch out, it gets brutal at the end!